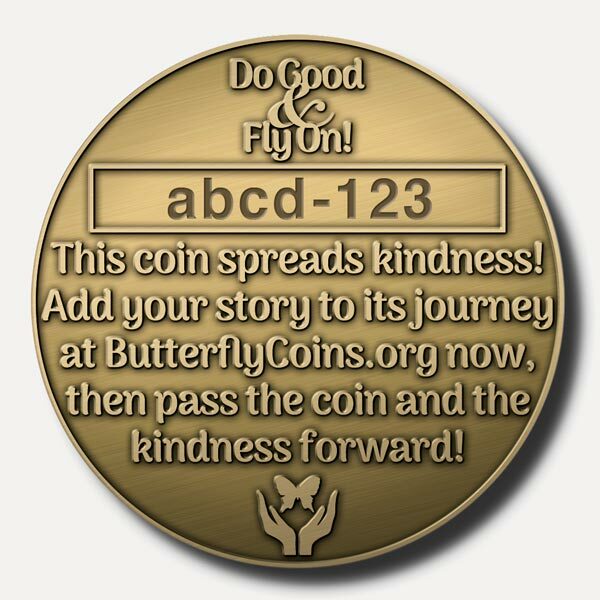 Butterfly Coins - Do Good And Fly On! Join Our Movement. Make A Difference. Did you get a coin? That’s awesome! We’re counting on you to tell us how the coin found you, then pass it on to someone else along with your own unique kind deed. This will help keep the coin’s journey alive forever! Please take a moment to Sign Up for a free account now, before making notes. This is optional, but it will let you follow this coin. The concept is simple. The effects are profound. 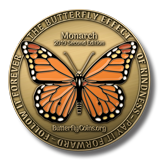 Each Butterfly Coin inspires and tracks the butterfly effect of kindness. By carrying one of our solid brass coins in your pocket or purse, you’re reminded to look for opportunies to help someone, be they friend or stranger. Pass along your coin to them along with your kind deed, and encourage them to pay it forward. The coins have unique tracking codes on the back, along with instructions to the recipient to make a brief story note about how they received the coin. Each coin has a dedicated story page, where you can watch your legacy of kindness unfold countless times into the future, forever. Our new 2019 coins are stunning. You’ll love them. 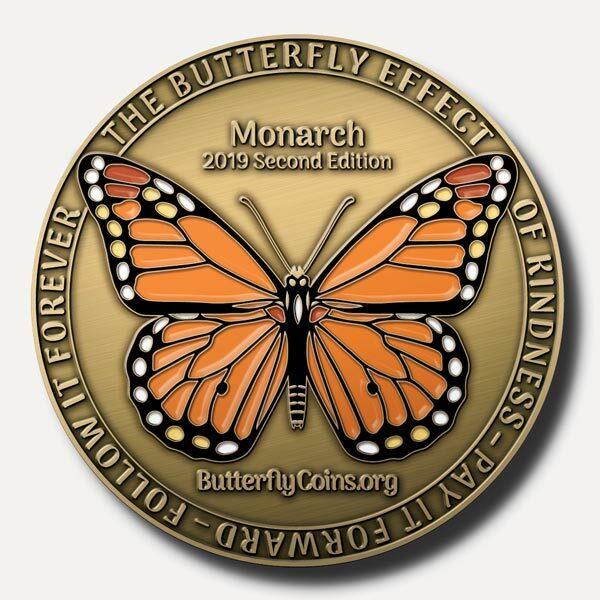 Our 2019 Second Edition coins, the Monarch, are on sale now for only $6.95! 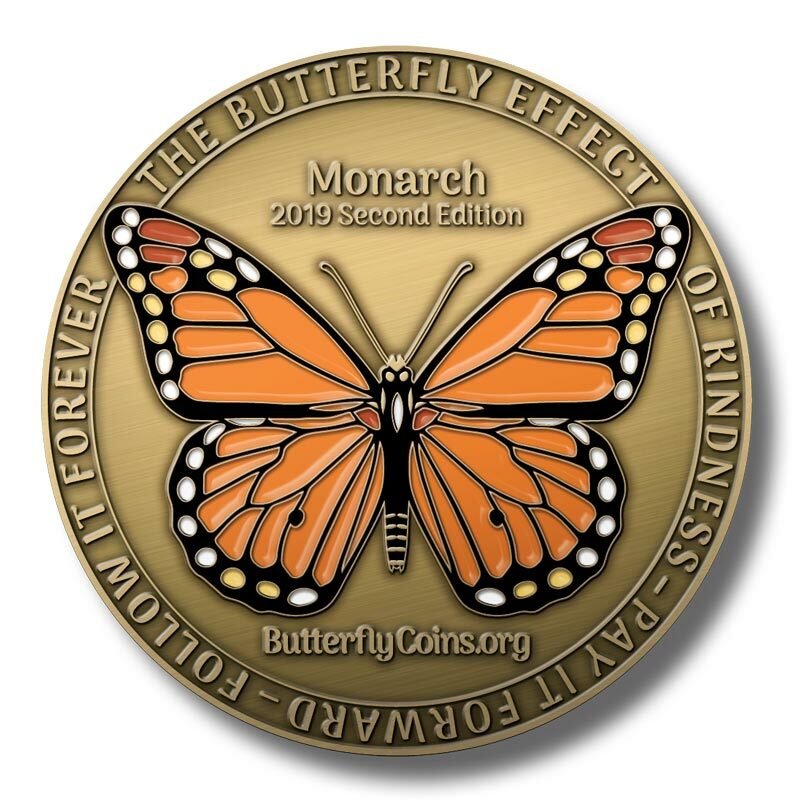 Like our sold-out 2018 First Edition coins, these are minted in solid, thick brass, two inches in diameter, weigh nearly two ounces each, and feature a five-color enamel-painted butterfly. They’re made to last forever, ready for their journey around the world that you will be starting. We’re so sure you’ll love them that we offer an unconditional money-back guarantee, and will pay for return shipping. Coins are in stock and ship out the same day from us in Austin, Texas if you order before noon Central time. We take all major credit cards, plus PayPal. Click here to place your order now. Prefer to order by phone? No problem. Give us a call at 1-800-765-8689. Each coin is engraved with a unique code on the back. This makes it trackable forever. When you give the coin to someone along with an act of kindness, the coin instructs the recipient to come to our website and make a story note, using the tracking code, then pay the coin — and the kindness — forward. Anyone who holds the coin can make a story note, describing how the coin came into their life, and how they passed it on. Story notes may be made totally anonymously, without signing up or logging in, because we want you to get stories about your coins no matter where they go. Kindness is a journey. And where it goes, we follow. 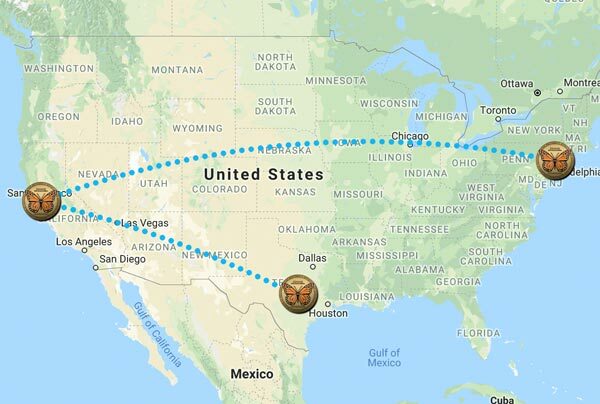 Included in the price of every coin is a dedicated story page that we host for you forever, complete with interactive map, pictures, and videos taken along the way. The smallest kindness that starts a coin could change the world, and you will get notified whenever someone new makes a note on one of your coins. We hope you join our movement today by ordering some coins. Looking for the perfect gift? You’ve found it. 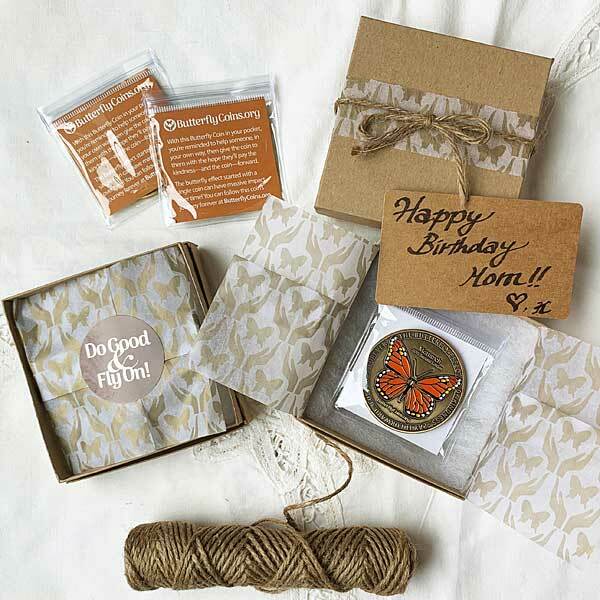 Butterfly Coins are a thoughtful gift for the smart, generous, and kind people in your life. We offer bespoke gift wrapping in our online store that you can add to any order. 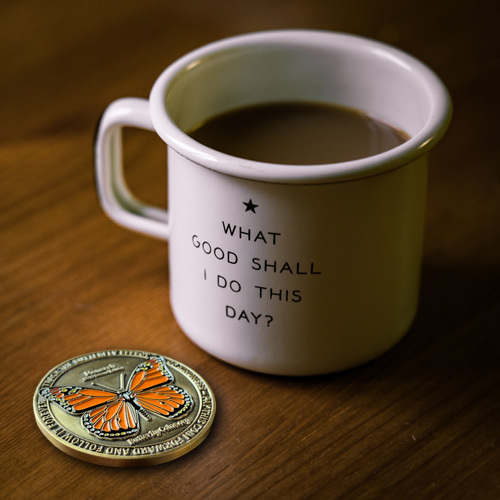 Consider giving out Butterfly Coins as ultra-unique favors at weddings, baby showers, graduations, birthday parties, holiday parties, and memorial services. Doing so will allow you and your event attendees to follow the future impact of all those traveling coins, leaving a perpetual legacy of kindness rippling from your event. Our ’Flyers say it best. Buy with confidence. We’re a small team. With big hearts. A veterinarian by education, Ron has been a tech entrepreneur since the 90s, and lives in Austin, Texas with his family and two dogs. Before Butterfly Coins, he co-founded BookCrossing.com and spent nine years in Silicon Valley founding and advising venture-backed startups. He designs our coins and built this website. Bruce and Ron were vet school roommates and have been close friends since then. Bruce and his wife, Heather, are also BookCrossing co-founders. Heather stewards a social venture, Talus Rock Retreat, in Sandpoint, ID, while Bruce owns and operates two veterinary practices, in Watford City, ND and Butte, MT. Ron’s wife, Kaori, manages our Coin Store, handling orders, shipping, and customer service. Originally from Okinawa, Japan, she came to the States for college, and has chiropractic and MBA degrees. When not busy packing and gift-wrapping coins, she enjoys playing tennis and shooting pool. Two clicks that can change the world: giving our Facebook page a "Like" and a "Share"! Join our mailing list. Be first to know. We send out the Butterfly Coin News once weekly or thereabouts. Be the first to hear about interesting stories of kindness, new coin releases, and special offers! You can easily unsubscribe at any time. You’ve scrolled this far? Explore our website! Learn more about how it all works, see our mission statement, read some coin stories, browse our forums, see our press coverage, check out some coin release ideas, take a moment to sign up for a free member account, or contact us. You’ll love it here!